Girrrl Stop! : Get Rid of Negative Thought Squatters! Negative thoughts, we all have them from time to time. Sometimes they come in quickly like an express train that is 10 minutes delayed and other times they linger like Baptist church people after service is over. They are the thoughts that can speak to the core of your soul and make it difficult to discern the truth from the lies. Negative thoughts like: I’m not good enough or I’m too much of this or too much of that. Whatever the thoughts may be for you, you can get past them. One thing about a negative thought is that they rarely show up out of nowhere but rather they been planted some time ago and over time, they’ve been watered by life’s experiences and our beliefs about ourselves. We can almost look at them as seeds that have been planted in our psyche over time, buried beneath and then they grow. I equate negative thoughts to squatters. You know squatters right? The people who take up residence in a property they don’t own. Shortly after my father passed away we were left with the task of cleaning out a property that he owned. There were people living in there paying rent to one woman who was living in the house also. She was collecting rent and pocketing cash on a property she didn’t own (yeah Baltimore off da chain!). Long story short, we asked her to leave and she refused. We called the police and much to my surprise they sided with her! We had to go through the courts because apparently squatters have rights! I’ll never forget the day we came to the house when they were actually evicted. Even with the notice on the door they still didn’t believe they were about to be evicted. When we arrived with law enforcement deez fools were cooking breakfast – I can remember the stench of the pork bacon frying on the stove; I didn’t eat bacon for like 3 months after that! The whole ordeal was a complete hot mess! Just like this woman became a squatter in my father’s property, negative thoughts can squat in our minds, hearts, and spirit. They linger there, hangout, cook up bad smelling breakfast and fully take up residence in a property they don’t own! Glory be to God that the eviction process is not that extensive for the believer and the ‘negative thought squatters’ don’t have rights! The God we serve is the property owner, the law enforcement, the judge and the jury and He can evict them for good! Just hand those thoughts over to Him – relinquish control! Allow the peace of God to overtake you for a guarded mind in God – Phil 4:6-7, stay in prayer and let your mind and heart be filled with God’s peace. Satan sends distractions and disruptions that cause us anxiety in our minds and spirits. Allow yourself to be filled with God’s peace which will guard your mind from negative thought squatters! Allow yourself to be a living sacrifice for a renewed mind in God – Romans 12:2, keep God’s Word and His Ways front and center in your life. This is the only way to be transformed! Allow God to saturate you so that you can be renewed in Him. Negative thoughts can’t squat in a renewed mind, they may come to visit but they will quickly leave because the environment is not conducive for their lifestyle! Allow yourself to meditate on God’s Word for a refreshed mind in God – Phil 4:8, you have to make the conscious decision to meditate/think on things that are true, noble, just, pure, lovely and of good report because this is what will keep the negative thought squatters from taking up residence. 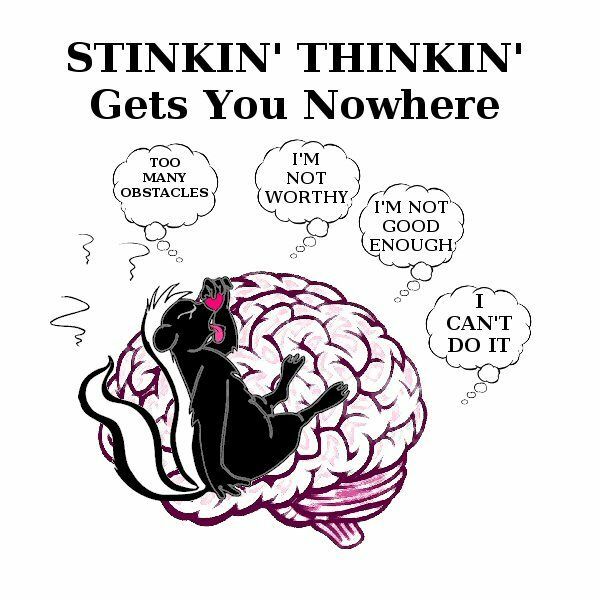 Get rid of the “stinkin’ thinkin’”! Begin to think differently, this will in turn enable you to move differently. Allow God to evict the negative thought squatters so that you can operate fully in Him!